Travelers today have sought out unique ways of bringing home souvenirs from their travels. And it may not just be souvenirs but may also talk about where you want to travel. Can you really think of something that speaks of both these things? Well, tattoos have definitely become the latest tool for expressing one’s wishes, likes, and dreams. If so, then why not for your travel dreams or travel souvenirs. 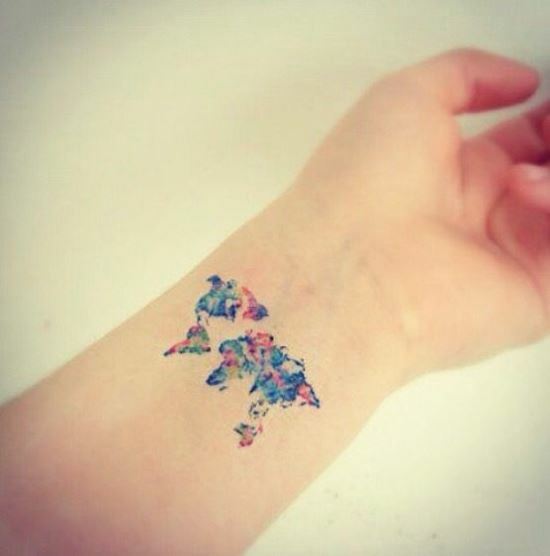 Moreover, you can also use travel tattoos to ink out your favorite places around the world. There are numerous ways and tattoo designs through which you can portray your traveling ideas or adventures on your body. A travel tattoo that you choose to ink on your body may be large or small in size, but would definitely speak of either your travels or places you would like to visit. Many travel lovers also get symbols related to their hometown onto their body. The postal stamp symbol of your hometown inked on your body is quite a unique and interesting way to show your love for traveling. The most common symbol that you would find inked on any travel lover’s body is that of an airplane. The words ‘wanderlust’ and ‘adventure’ are also commonly seen inked by travelers. Other common travel tattoo ideas include paper airplanes on the wrist or ankle, or any other part of your body you choose. This symbol may also be tattooed along with travel quotes such as ‘miles to go’ or words describing traveling such as wanderlust or adventure. A world map is again one of the popular symbols tattooed by travel lovers. You may have a miniature version of the world map on your wrist or have a large tattoo on your back. What’s more, you can have the places already visited by you inked in color, just to distinguish them turning into a great travel tattoo. Famous places that you wish to visit can also be inked on your body. Or, you may ink the famous places you have already visited on your body. Some of the famous places that travelers are often seen having inked are the Eiffel tower, the pyramids, tower of Pisa etc. You may also have all these famous places combined into travel tattoos in the form of a to-do list, or in other words the places you have to visit. If you have traveled long and far and have one place in mind that you would never forget and is the one you would be ready to visit at any point in your life then the coordinates of that place can also be inked on your body. Not just that, but getting coordinates of places you may wish to visit may also work as one of the great travel tattoo ideas. There are many such great tattoo designs that you can get inked on your body and show off your travel souvenirs or make the world know of the places you wish to travel to. Here are 50 adventurous travel tattoos that you may want to ink on your body.